Dance as Important as Math? Yes! We all danced for joy when Sir Ken Robinson’s and Lou Aronica’s article, Why dance is just as important as math in school, was posted at IDEAS.TED.COM. As a patron of the London School of Contemporary Dance, Sir Robinson was invited to present an annual lecture. Lucky for us, he chose to speak about dance. For years, we’ve witnessed firsthand how dance enhances youth self-esteem, self-efficacy, physical fitness, academics and more. While each student’s story is different, every story describes the transformative journey of a young person discovering his or her true and best self through dance. Nobody invented dance. It is deep in the heart of every culture throughout history; dance is part of the pulse of humanity. It embraces multiple genres, styles and traditions and is constantly evolving … Some people have long understood that dance is an essential part of life and education. We could not agree more. To us, dance encourages students to reach deep into their bodies and minds and bring to the surface their personalities, convictions and unique physical presence. When you add to this the teamwork, discipline, focus and determination that dance also demands, you have an art form that is capable of nourishing the whole child like few other sports or art forms. Along these lines, Robinson argues that dance and other physical activity should have the same status in schools as math, science and language, and he’s not kidding – spiritedly advocating for “the equal importance of dance with the other arts, languages, mathematics, sciences and the humanities in the general education of every child.” According to a Los Angeles County Arts Education Collective 2018 Report, only 0.5% of elementary schools and 2.8% of high schools provide year-long instruction in dance. Across the 20+ sites where we operate in Los Angeles, we too see dance treated as secondary to music and visual arts. Yet, its impact is just as or more powerful so we’re working tirelessly to change this statistic. 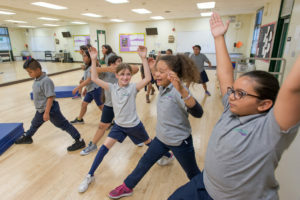 Robinson’s article highlights the work of Dancing Classrooms, which teaches ballroom dance to students during the school day: “Dance education has important benefits for students’ social relationships, particularly among genders and age groups. Many forms of dance, including ballroom, are inherently social. They involve moving together in synchrony and empathy, with direct physical contact.” Rightly so, Robinson notes that these qualities help people get jobs as “dance promotes many of the personal qualities that employers recognize as essential in a collaborative, adaptable workforce.” As a nonprofit employer ourselves, we’ve hired our alumni for exactly these reasons. Currently, four are on staff – two as teaching artists and two as administrative staff … and we couldn’t be happier with their spirit, dedication and high-quality work. While dance may not fully explain these improvements given that the relationship between physical activity and educational achievement is well documented, like Lois above, the awards and scores received by our most valued partner, Gabriella Charter Schools, a dance-themed public school, strengthen the dance argument even further. In April 2018, GCS was once again named a California Distinguished School, and in 2017, was awarded the highest Western Association of Schools and Colleges accreditation level. In 2016, GCS was included on the California Honor Roll and received three state awards – Gold Ribbon, Title 1 Academic Achievement Award, and Exemplary Arts Education Program Award. 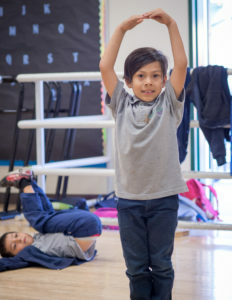 We know well the quality of academic instruction provided at GCS, which has earned the school these prestigious awards; but we have also seen firsthand how quality, consistent, in-school dance education has helped students be more focused, engaged and ready to learn in the academic classroom. Eunice Castro, everybody dance! alumna who studied aerospace engineering at UC Irvine, shared with us that Everybody dance! kept me off the streets and away from the drugs and gangs that are common in the neighborhood I grew up in. It provided me with opportunities that I otherwise would have never had and taught me how to grow and accomplish my dreams and goals in any environment and created the successful, mature, and optimistic individual I am today. When I went to dance, the outside world stopped, and inside those closed doors were just the teachers, music and us. Why dance is just as important as math in school is excerpted from the new book You, Your Child and School: Navigate Your Way to the Best Education by Sir Ken Robinson and Lou Aronica. Published by Viking, an imprint and division of Penguin Random House LLC, New York. Copyright © 2018 by Ken Robinson.